This recipe is brought to you with the help of North Coast Organic. All opinions are my own. 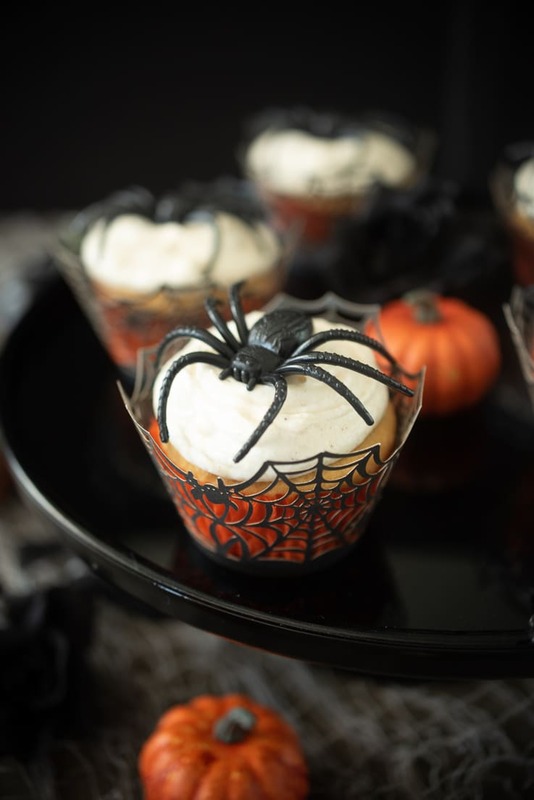 Halloween Pumpkin Spiced Applesauce Spider Cupcakes are a fun, seasonal dessert that your kids will not only have fun making, but eating too. The secret to the flavor in the cupcakes comes from the applesauce. There is only one season I look forward to as much as Christmas and that is fall. What’s not to love? The cooler weather (I live in the Arizona desert, you understand) pumpkins, Halloween and all of the fall produce, in particular the apples. North Coast Organic is running a giveaway to win a full year’s supply of apple products. Check that out here > giveaway. Different apple varieties peak at different times, but there’s always something you can get year round and that is applesauce. Today I’m showcasing North Coast Certified Organic Pumpkin Spiced Applesauce. It doesn’t get much more seasonal than that. North Coast Organic Applesauce flavors range from traditional cinnamon to tangy apple apricot, apple with berries and strawberries. They come packaged in cups, jars and even convenient pouches that your kids would love in their lunch boxes or for a healthy snack on the go. North Coast Organic have been perfecting their skill of organic farming and apple products for over 90 years. Their certified, KSA Kosher certified applesauce, apple juice and vinegar are made only with U.S. grown apples and are free of added sugar, preservatives and GMOs. 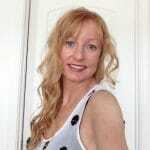 To learn more about North Coast Organic, visit their website and check out their new products. Click here > North Coast. 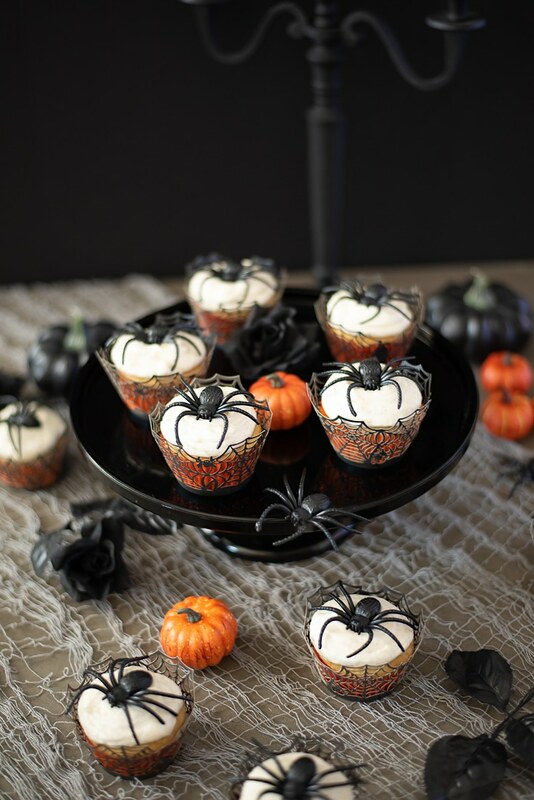 With Halloween, applesauce and pumpkins on my mind, all of these were factors that inspired me to come up with these cupcakes. 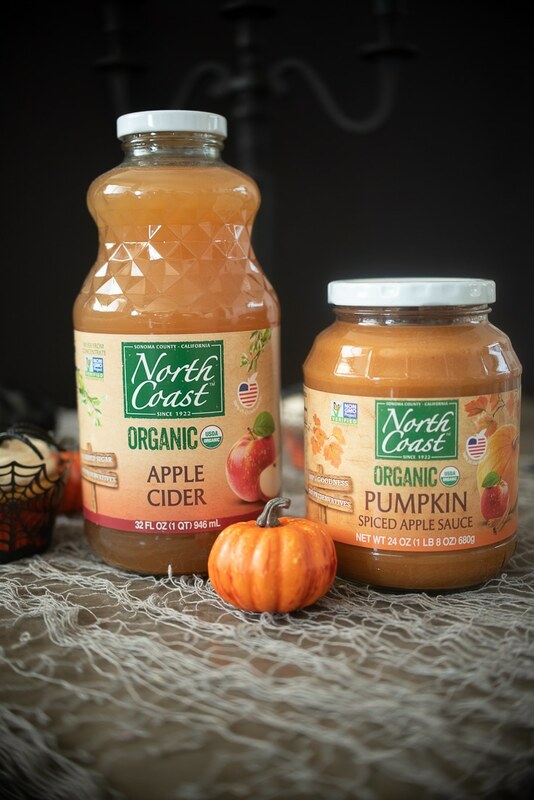 Made with real ingredients, North Coast Organic Pumpkin Spiced Applesauce adds all the apple/pumpkin flavor you need. Just as an aside, as you may need to fend off your neighbors, my kitchen smelled like pumpkin pie when the cupcakes were baking. The frosting for the cupcakes is cream cheese with a little pumpkin pie spice to mirror the pumpkin spice in the applesauce and drive home the pumpkin/fall feeling. I had a lot of fun with these cupcakes. 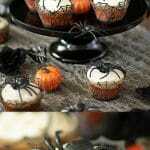 I have many Halloween-themed recipes on my website from skulls to scorpions and now spiders. The web cupcake liners, large fake spiders and everything you see can be purchased from the internet. 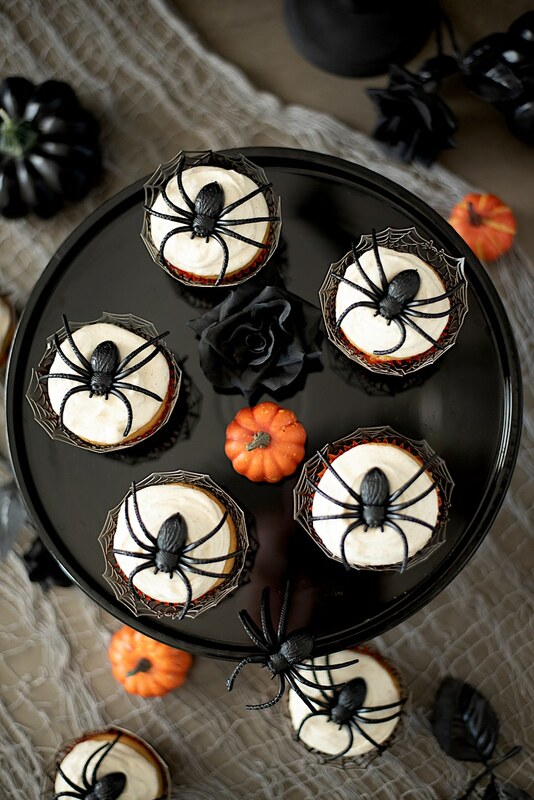 Fluffy cupcakes flavored with pumpkin spiced applesauce with pumpkin spice frosting are made spooky for Halloween with fake spiders. Preheat oven to 350°F. Line a 12-muffin tin with liners. To a bowl add the butter and sugar. Beat on high until light and pale using an electric mixer. Add the eggs, one at a time and beat until mixed. Mix in the pumpkin applesauce. Add the flour, baking powder and salt to a separate bowl and mix well. With the mixer on low add little dry mix to the wet mix, alternate with a little milk until all the flour and milk are used. Mix until well-combined and smooth. Don't over mix. Use an ice cream scoop and divide the batter between all the cups, a little over halfway filled. Bake for 20-25 minutes until golden. When a toothpick inserted in the center it should come out clean. Remove from the oven, remove the cupcakes from the pan and cool on a wire rack. Beat the cream cheese and butter with an electric mixer, add the vanilla, mix well. Slowly add powdered sugar while beating. Add the pumpkin pie spice and mix well. Refrigerate for 30 minutes to make topping the cupcakes easier. Top the cooled cupcakes with the frosting. 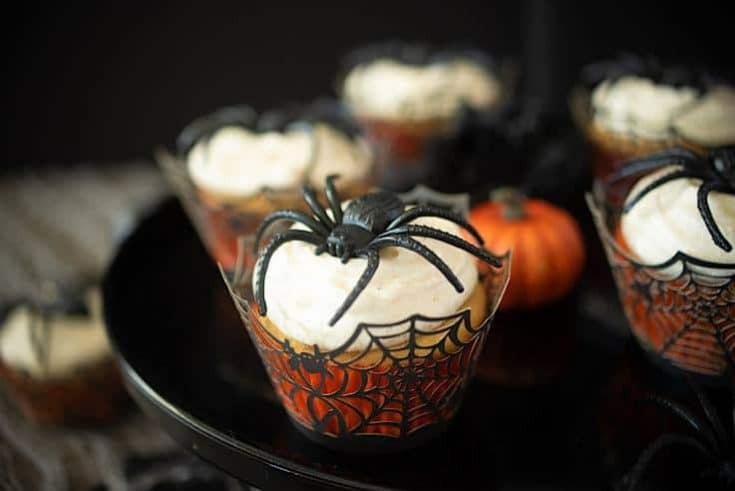 My daughter sent me this recipe and decided she wants a spooky spider halloween party so we will be making these. They look amazing, I hope we can re create them. It sounds like a fun party. Enjoy the party and the cupcakes. What a great idea to use the flavored applesauce for these cupcakes. I can’t wait to make them with my kids. Thank you, they are so good and the applesauce makes them moist. You’re kids will have fun with these.